LDN Décor provide a range of Indian decorations for parties and events in London for hire. Our décor is perfect for home use and marquees. Popular items include backdrops, benches, cushions, mattresses and lanterns. Probably the most important and first item you will look for is the backdrop. This sets the scene and creates a focal point for all your pictures. Our backdrops are designed to fit homes and marquees as they are 2 metres high. 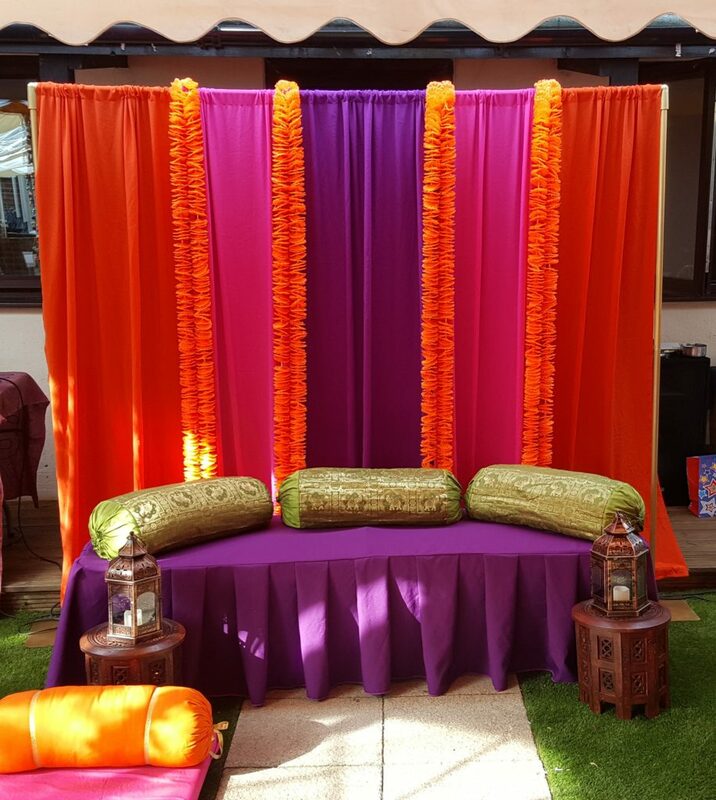 We have a range of backdrops ideal for Birthday parties, Mehndi and pre wedding parties and any other function which requires a backdrop. You will then need to think about seating and if you require a main seat. Our bench can create a great main seat and can seat up to 3-4 people. We usually add a few bolster cushions to give it a colourful and stylish look. Other seating includes small low single seats to create a chill out area or for use by the mehndi artist if it’s for your mehndi party. Floor mattresses are very popular to use at home parties. These allow your guests to comfortably sit on the floor. We can also add some benches or folding chairs if you require additional above ground seating. Indian flower garlands are a must have item for 2018 if you are having any mehndi or pre wedding party. These add so much colour and gives the function an authentic traditional look. We have a range of garlands in various colours which can be used on the backdrop or hanged on the side of the marquee. These can transform the venue and used for various functions. As the good quality garlands can be expensive and you require a lot to transform a venue, hiring is often a much more cost effective way of having these at your functions. Indian umbrellas are also another popular Indian decoration used for parties. These look great hanging from a marquee, placed on the floor and also create a great photo prop when held in one’s hand. LDN Décor have many umbrellas available for hire. Indian cushions, mehndi cushions and bolsters are also essential for creating that mehndi vibe. Even if you are not going to hire floor mattresses, having a few scatters on the edge of the backdrop or bench adds to the look. We have many cushions in stock and can cater for your needs. You can choose from having square cushions or long cylinder shape (Bolster) cushions. We also have a range of small Bolster cushions which are more economical than the larger ones. So as you can see there are so many different Indian decorations which can be used for your home party. We are a unique company which hire such decorations in London and you can choose us to decorate the venue or get creative yourself and decorate it using our decorations. Feel free to browse our site for more information, pictures and some prices. We don’t always have the latest set ups on our site so please contact us for more information on our Indian decorations for home parties. 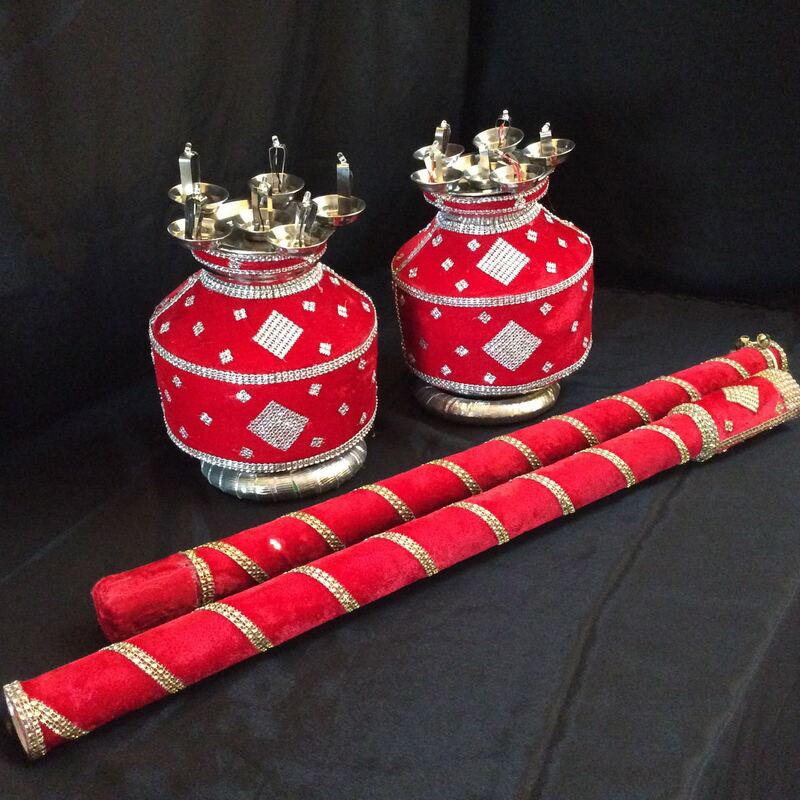 You can hire our Jago sets in London, which includes two Jago Indian pots with battery powered candles and a Jago stick. These are required for the Jago ceremony leading up to a Punjabi wedding. Jago which means “wake up” gets everyone in a dancing mood usually in the days before the wedding. Two Jago pots are required and passed around as everyone takes it in turn to dance, holding the pots above their heads. As these can be expensive to buy and are not required after the wedding a great solution is to hire them. Our Jago pots which have battery powered candles and a decorated Jago stick can be hired for £40 in London. You can add this to your mehndi décor package or pick them up from us. People love an excuse to dance and having a Jago set in the build up to the wedding really does make a difference. They are often used in more than one ceremony and the self hire service allows you to fully utilise them at your different parties. Contact us to hire your Jago, Jaggo Indian pots, Indian dancing pot, Jaggo stick, decorated Indian stick. You can also hire a Dholki to complete your pre wedding, Sangeet party props. Mehndi mattresses are very popular for creating a comfortable floor seating area. They are made from good quality foam and come in a range of colours. You can hire our floor mattresses from as little as £75 (for 4 mattresses) or add 8 cushions for £90. This is for pick up and return in Wood Green, N22 (North London). If you would like these delivered and picked up we charge an additional £50. Each mattress is 60cm x 180cm, 4 of these should seat 16-20 people. Additional mattresses can be added for £10 each. 4 Mattresses (60cmx180cm) with 8 cushions Mattress = Purple/Aubergine. Our low prices gives you the ability to create a great setting for your mehndi, sangeet and other pre wedding party. These items are available as self-hire, dry hire allowing you to have flexibility on layout and for you to use in more than one function. This is great as the lead up to the wedding often requires such props to be used for more than one day, be it in a marquee, home or hall. We also offer these items within our décor packages where we set up all the items for you. We also offer Jaggo sets and Dholki hire completing your pre wedding party prop requirements. Banister draping has long been a popular feature of decorating homes for functions and parties. As it can be difficult to drape ceilings without nailing into walls, many people choose to drape their banisters and staircases especially for their pre wedding and mehndi parties. Using fabric and colour really adds to the atmosphere and works well with other decorations. Not all banisters can be decorated so it is advised to send us a picture of your banister or area which you have in mind, so we can see how we can help. Along with banister decorations we offer many other home mehndi decorations so please browse our site and have a look at what is on offer. LDN Décor offer a great selection of Indian, Asian & Moroccan decorations suitable for a marquee or tent. Let our local designers decorate your marquee and create a great atmosphere. Some people decide to hire a marquee from a company and usually find their local marquee companies are the cheapest due to low or no delivery charges. However many people encounter the common problem, that their local marquee company do not offer Indian decorations or chill out themes. This is where we can help, by transforming your marquee into a stylish venue at low prices. Others will decide not to pay hundreds of pounds towards a marquee hire company and buy their own tent. This can work out cheaper and you can use the tent for other functions. This is common if your party is during mild weather conditions and does not require a heavy duty marquee. Using our decorations and theme’s you can have your marquee look professional and fit to host your guests in a stylish atmosphere. Whether you require a nice backdrop, cushions, low seating or floor seating. Indian decorations for your marquee are a great addition for your mehndi, sangeet or pre wedding party as well as birthday parties. 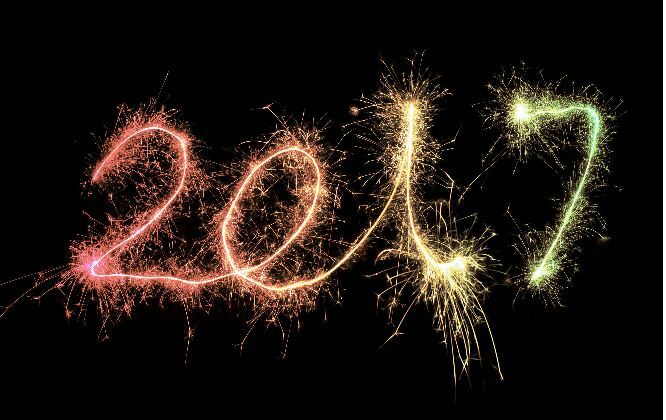 We now have added more decorations for 2018. LDN Decor have a number on new lanterns and Moroccan pouffes which can be used in marquees. Contact us now to find our more. 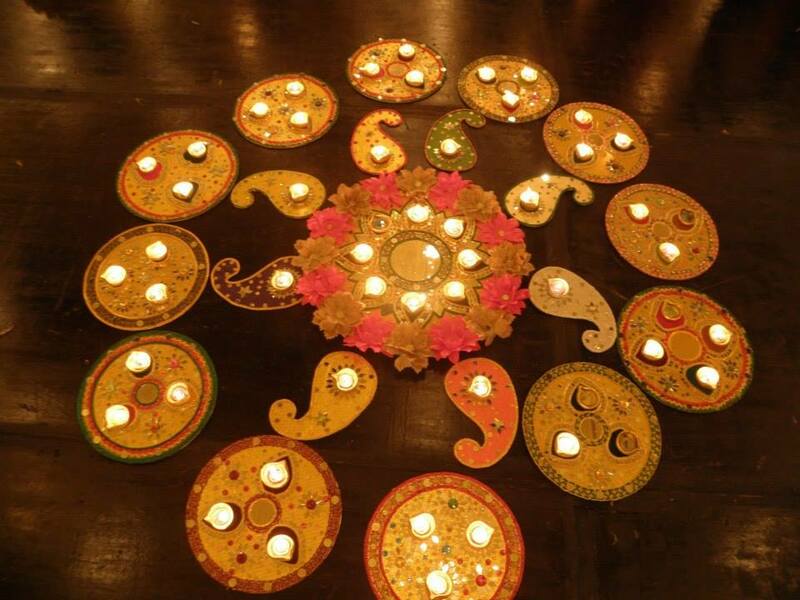 We provide Mehndi décor sets and packages around London. The great thing about providing décor sets is that you know exactly what you are going to get. Set themes and combinations allows us to provide set prices meaning you get the most economical value and peace of mind. At LDN décor we work hard to create set décor themes and keep up to date with the latest trends. Working with our designers we have constant brainstorming events to come up with new designs. What is including in a typical mehndi décor set? Our cushion set includes 6 floor mattresses and 14 cushions. This creates a great look but also offers a soft seating option for anyone who wants to sit on the floor. If you do not require the floor mattresses you can replace this for 1 rug. This option includes 1 backdrop (2 metre high & up to 3 metre wide) along with the basic cushion set. The backdrop makes a real difference and a great focal point for taking pictures against. This option combines the Backdrop cushion set and some additional décor items such as side table or footstools. A very popular option includes a bench with cushions. This is great for a mehndi party or function with requires a focal seating point. This includes all the items listed under the backdrop cushion set. Check out our fully themed set ups, prices dependant on each theme. Our Mehndi décor package, pre wedding décor package are great for home parties, mehndi parties, sangeet parties and marquees. They are also great for halls and small venues. We cover North London, East London, and West London. The following areas are very popular hires for our set décor designs: Wembley, Stanmore, Harrow, Southall, Ilford, Redbridge, Enfield and Finchley. We love a good pre wedding party and understand the requirements for Sangeet and Mehndi parties. Using scatter cushions and varies other decorations creates a great atmosphere and gets the ladies up for a Sangeet party full of dancing and celebrations. Even if you are having a small party at home, our decorations really do help. We tend to also use Mehndi Thaals and other items common in this ceremony so check our designs out. LDN offer set designs, themes, layouts instead of a fully customisable service. This allows us to focus on providing low prices for our customers compared to other décor companies. As we spend less time sourcing new products to tailor each client we pass this cost savings onto you. So if you like the set ups displayed on our site you can feel confident that you will be receiving the set up at the lowest price possible. We do not negotiate on prices as we believe in offering all our customers the lowest prices feasible. For more information on our packages and prices please visit our packages page. Here you will find pictures of the products and layouts of décor. As we believe in transparency we have also issued our prices on our site. LDN Décor are preparing for a great 2017. With new stock arriving, new layouts and themes being created by our amazing designers, we are very excited for the future. We will be updating our site with more information about packages, themes and prices. We like to be transparent so we issue our prices on our site. Our packages and prices are set, so if you like what you see get in touch and book now.